We are so excited to once again have another blog hop!! The D2BA DT has some inspiring projects to share with you!! You should have arrived here from Tracy’s blog! If you haven’t and would like to hop along with us, please go back to the Dare 2B Artzy Blog to start at the beginning! Winner will receive one stamp set and an ink pad!! In keeping with our Non-Card Celebration Hop theme, I have put together something a bit different to share with you today. I’ll admit, I’m a purse freak. It’s actually become a sort of running joke between my husband and I that I “somehow” manage to purchase a purse a month. Of course there are pre-requisites. I mean we all have that list of must haves for it to be the “perfect” purse. It has to have an outside pocket for my cell phone, it has to have inside pockets for “stuff”, and it must be cute, blah, blah, blah. The list goes on. My husband doesn’t give me too much grief as long as I adhere to our agreement of giving away one purse for every purse I bring into the house. So far I owe him two purse giveaways – shhhh – don’t tell him, LOL! At any rate, I found a paper pattern for these adorable little tote bags online. They sort of resemble purses, but the upside is you get to decorate them however you’d like and fill them with little fun things and give them away (or hoard them). I created these two little bags using the In Bloom Collection papers from Dare 2B Artzy. 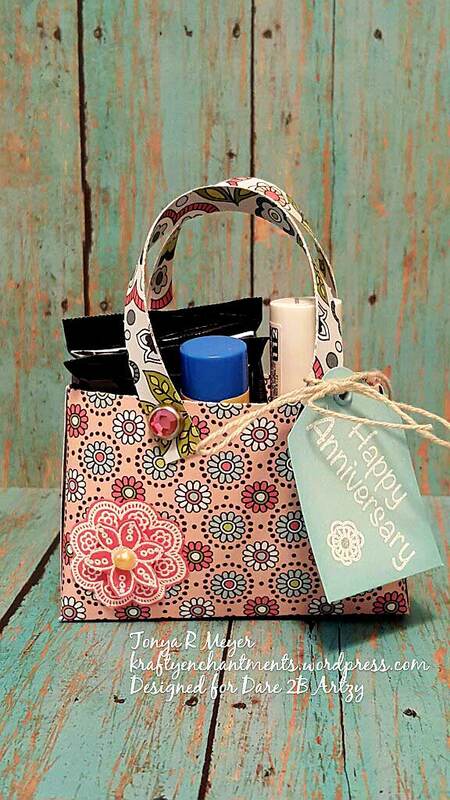 I think the floral patterns make for great little spring bags perfect for any celebration. They are gorgeous papers and the colors are so pretty. The base of each bag is a mere 3 ¾ wide by 2 ¼ tall. They may be itty-bitty but they’re super cute. The upside to these cute bags is there’s absolutely no paper waste as they use a 6×6 piece of paper and you use every bit of it. For my bags I attached my handles using decorative brads like the leaves and pink gems which went well with the patterned paper from Dare 2B Artzy. You could use any kind of brad or possibly even an eyelet for the handles. I used the small flower cluster stamp from the Happiness Blooms stamp set and stamped with some Versamark and then embossed white embossing powder. Next I fussy cut the flower out and layered them on top of each other to create a little embellishment for one bag. I added a yellow pearl to the center of the flower. On the other bag I used some fabric flowers that I had in my craft stash and layered them up with a brad for the center and then punched a hole into the bag and put the brad through to hold it in place. I love how the pink and green colors went so well with this paper. I would rock this as a purse – let me tell you! My bags are intended to be little work anniversary gifts for members of my staff so I added a little tag and stamped Happy Anniversary from the Owl Wedding Stamp Set and heat embossed it. I also stamped the tiny flower from the Happiness Blooms stamp set on the tag and colored it with a bit of Wink of Stella for some sparkle. I thought these little gift bags would be a fun treat to thank my staff for their work and dedication on the anniversary of their hire date. They deserve a little pampering in a cute package. To give you a little better idea of the size, I was able to get two wrapped Ghirardelli Chocolate squares, a Burt’s Bees Lip Balm and one bottle of nail polish in the bag. I thought that the Essie brand polish worked best because of the square bottles which seem to fit better inside the bag. These bags would make great hostess gifts, bridal party gifts, and fun gift card holders or even for those I’m thinking of you occasions. They’d even be something fun to tuck inside of your kids lunch bag. You don’t need an excuse to celebrate – any day can be a celebration day! It’s also a great way to use up all of those 6×6 pieces of paper floating around your craft room. Decorating options are endless with adhesive gems, dots and pearls. You stamp the paper beforehand or decorate with fussy cut stamped images afterwards. The sky is the limit. I bet I could even manage to create a tiny pocket for the outside of one. Your next stop in the hop is Monica’s blog! Happy Friday & Happy Hopping! Your little purses are adorable! Thank you Avra! Glad you like them. I absolutely love your little purses!! They are such a cool idea, I’m definitely going to try this! Thank you Lissa. If you want the instructions on how to make them, you can send me an email in the contact me link and I’ll send you the photo tutorial this weekend. I LOVE these little purses! What a cute idea – and pink and green is my favorite color combo. I’m sure the recipients of these little gifts will be very impressed, I am! Thank you Carol! Us bag hoarders gotta stick together. Your purses are so adorable! I love them!!! Make a nice gift for someone! GREAT job!! Thank you Kendra! Glad you liked them. Wow!! When I first saw these little gift totes I thought they were actually real purses! These are just adorable and I’m going to have to find that pattern and make a few myself. How fun these would be to decorate. Wonderful idea, my great grand daughter would love this! Thanks for sharing. Thank you Sherry! Yes, they would be fun to make and decorate with your grand daughter. These are all so cute I would want to keep them all! They would be perfect favors for a bridal shower too! Thank you! They would make great bridal party favors. Adorable! They look like “real” purses. How fun! Oh my goodness. How cool are these! !